As the UK’s largest commercial dishwasher stockist and distributor, we commonly encounter customers that have specific requirements for their washroom designs and installations. To cater for every need we can specify, design, manufacture and install bespoke dishwasher inlet tabling that is custom tailored to your exact needs. All bespoke custom fabrication dishwasher tabling is manufactured from high grade stainless steel (AISI304) throughout and delivered in a one-piece construction, to ensure ease of installation, supreme construction quality and long-term durability. 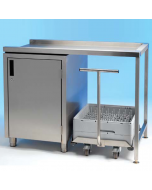 A range of additional extras and equipment can be specified into designs including solutions for food waste disposal, pre-rinse and wash arms, integrated cupboards and shelving or sink configurations (with or without taps) and sink valances. Online prices for bespoke custom fabrication dishwasher inlet tabling are guide prices only. A fully customised service is available, including no-obligation quotation and design. Guide prices are based on standard options that customers typically select for their washroom design and installations. Please contact our specialist customer services team for more information on the fully customised service and bespoke fabrication options. Our dedicated staff will be able to give you accurate prices on application. The Kingfisher catering brand specialises in low cost, high value commercial dishwashers, glasswashers and associated accessories. Unrivalled in build quality when compared to other manufacturers within this category, all Kingfisher warewashers are supported by a commercial warranty with access to a UK based nationwide service team and parts distribution network. Thanks to excellent service and after-care, this budget warewashing brand is a true professional equipment partner that businesses can rely on.